American snipers today expressed gratitude that their endeavours to supply death at a great distance had been formerly sanctioned by Jesus Christ following news that their sniper scopes contained inscriptions of teachings from the Bible. 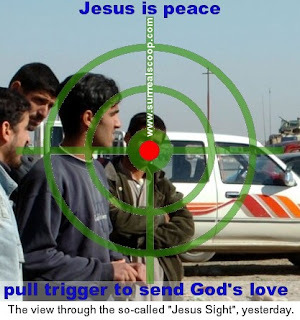 The company, Jesus Loves War Machines, based in Scranton, Ohio in the USA, has been supplying the so-called “Jesus sights” and other equipment to the US military for decades and is proud to run its business upon Biblical principles. The company's product range includes the Christ Almighty Assault Scopes which boast “a compact low recoil optic ideally suited to delivering God's love in close combat situations” and the long range sniper scope Divine Retribution 300XL that “combines high specification zoom optics with a high intensity edge detection overlay to give you a range of over two kilometres to send the word of God from your trigger finger”. The company said that it saw no reason why any of its products should not carry the word of God into battle, and denied that it was using the US government's military agencies to conduct its own Christian jihad. I think it's not appropriate to recall God and arms in one posts. paper writing services is the best way to spare some time for your husband/wife or children!